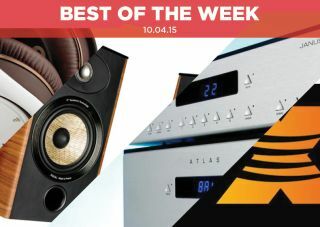 Best of the Week: DTS:X unveiled, BBC 4K broadcasts, 4K OLED TV review and more | What Hi-Fi? This week on What Hi-Fi? DTS announced their rival to Dolby's Atmos in the form of DTS:X, it emerged that the BBC are looking to broadcast programmes in 4K by 2016 and Sky are rumoured to be the subject of a bid from French media company Vivendi. Elsewhere we have reviews and plenty of them with Polk Audio's Ultrafocus 8000 noise-cancelling headphones, Focal's Aria 905 standmount speakers and Aesthetix's Janus/Atlas pre/power combination. It's also new What Hi-Fi? week with the May issue available online and in all good (and bad) newsagents. In it there's a big, exclusive review review of LG's 55EG960V 4K OLED TV gracing our First Tests section (you can read it online now). Otherwise there's the latest news and reviews of home cinema and hi-fi products, a look at the impact virtual reality could have on home cinema, and reviews of portable headphones, projectors and a feature on music streamers. DTS has revealed its rival to Dolby's Atmos surround sound system and it's called DTS:X. Like Atmos it's an object-based, surround sound system but unlike Dolby's effort it does not need extra speakers to work; it's engineered to support "any speaker configuration within a hemispherical layout". The company also announced when it will be available: it'll be heading to selected home cinema receivers – Denon, Pioneer and Yamaha included – later this year by way of a firmware update. 4K has built up a head of steam and it looks like the BBC is ready to jump on the 4K train. Michael Postgate, the BBC's chief technology officer, spoke to the Financial Times about the corporation's future plans and said that it's likely that TV programmes will be broadcast in the format "as standard" by 2016. According to Postgate it's all part of the broadcaster's plans to be at the cutting-edge of developing technologies with the Internet at the centre of the company's plans. Will we be seeing the Rio Olympics in 4K in a year's time? Rumours are circulating that Sky is in the sights of French broadcaster Vivendi for a mooted £28bn takeover. While Vivendi has yet to approach either Sky or 21st Century Fox about the acquisition, if a deal was made it would give the French media conglomerate over 20 million customers in five countries. "For an engaging, exciting listen, these full-bodied cans tick both boxes"
The Ultrafocus 8000 is big in both size and sound; if you are looking for a noise-cancelling pair of cans we wouldn't discount these from your shortlist. While others are a tad more effective at noise-cancellation and offer a more refined sound, there's a real sense of energy and confidence that's engaging. A good choice if you're looking for fun and excitement. "These are talented speakers, but it wouldn’t hurt the Focals to let their hair down"
The Aria 905s are a hugely accomplished pair of speakers. They have a few faults but if you appreciate absolute sonic efficiency then the 905s will absolutely float your boat. That efficiency comes at the expense of having some fun, but the performance on offer is good – lots of detail, fine dynamics and great timing put it alongside the best this price has to offer. It's a shame that the performance doesn't quite translate into one that's as fun as it is confident. Almost great. "The standard pre and power are great, but if you can stretch to them, the Signatures versions are well worth the extra cost"
Every now and then we come across a product of fantastic quality and this pre/power amp combo from Aesthetix is just such a product. The remote is a point of consternation, feeling at odds from the high-quality that's on offer elsewhere but that's forgotten once the Janus/Atlas pairing gets going. There's impressive scale and authority and a stunning level of transparency. If you can afford them, then this is an immense pre/power combo.